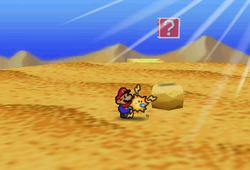 Paper Mario Description Changes the sound effects when Mario's attacking. Mario with Watt revealing the hidden ? block the Attack FX C is in. Attack FX C is a badge in Paper Mario. It can be obtained by hitting a hidden ? Block in Dry Dry Desert. The scene it is in is at the cross of the southernmost row and the column next to the westernmost one. If equipped, it changes the sound of Mario's attacks to an odd mechanical noise. This badge is hinted by a Toad in Dry Dry Outpost. "I see...an Attack FX C Badge. It is hidden in the desert... From the stone cactus by the path, you move three south and two west. You find a rock and jump on top of it. The Badge appears out of a hidden block." This page was last edited on July 22, 2018, at 03:41.